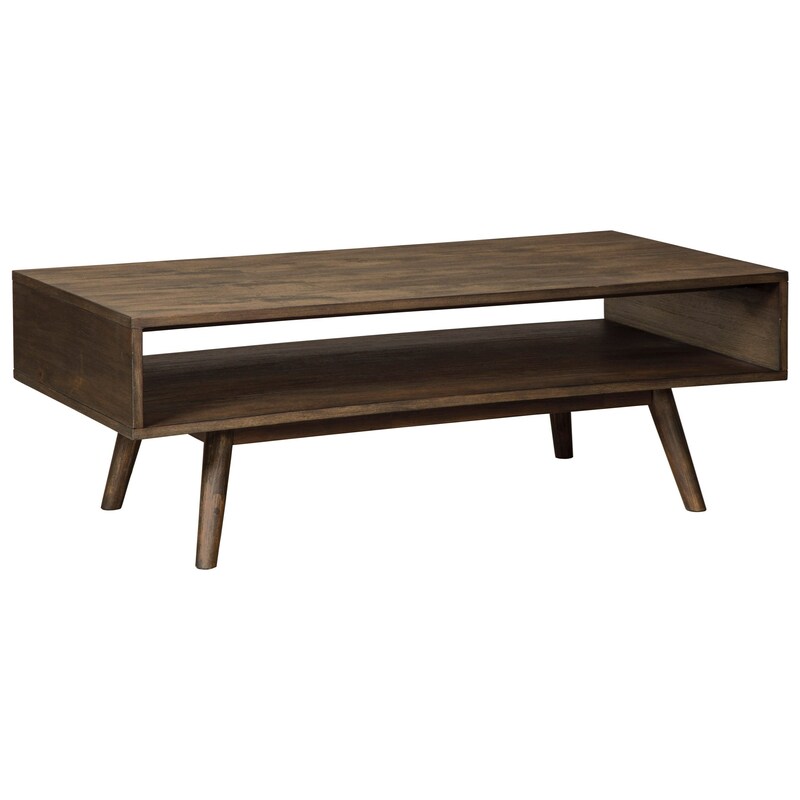 Show off your mid-century modern side with this rectangular cocktail table. The angled tapered round legs complement the clean lines of the table. The spacious open shelf at the center of the table is great for decorative accents and storage alike. The brushed dry finish over acacia veneers and solids offers fresh appeal to your living space. The Kisper Mid-Century Modern Rectangular Cocktail Table with Open Shelf by Signature Design by Ashley at Prime Brothers Furniture in the Bay City, Saginaw, Midland, Michigan area. Product availability may vary. Contact us for the most current availability on this product. The subtle mid-century modern design of the tables available from this occasional collection are always in the style. Simple contemporary lines complement acacia veneers in a dry brown finish. The Kisper collection is a great option if you are looking for Mid-Century Modern Contemporary furniture in the Bay City, Saginaw, Midland, Michigan area. Browse other items in the Kisper collection from Prime Brothers Furniture in the Bay City, Saginaw, Midland, Michigan area.